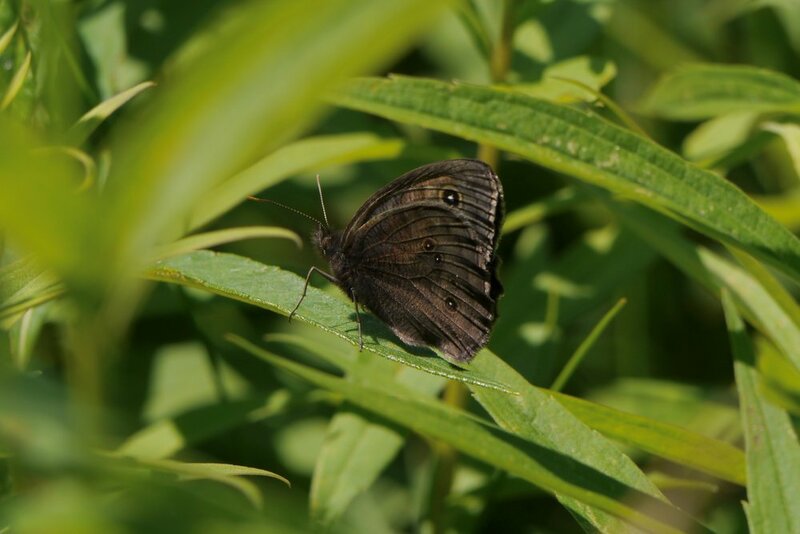 Monday, July 2 was a sunny day, with light winds, and warm weather: perfect for meandering through Goose Pond Sanctuary's beautiful prairies and count butterflies. Butterflies are important members of the food web (they eat and are eaten) and play a significant role in pollination. Thanks to their spread of pollen from one plant to another (which ideally results in a plant successfully producing seed and a new plant), we have diverse landscapes, and a variety of foods, medicines, and materials. Some butterfly species, such as the monarch, are experiencing huge declines and this annual butterfly count helps a network of scientists to understand population changes and help make better conservation decisions. These counts are done all over the country, in roughly the same time frame to get a large-scale perspective. Goose Pond staff and volunteers participated for the fifth year in the Mud Lake North American Butterfly Count. At Goose Pond, eleven counters divided into three parties while count coordinators Karl and Dorothy Legler surveyed with four others in wooded habitat at the nearby Rocky Run State Natural Area, Mud Lake Wildlife Area, and Schoeneberg Marsh Waterfowl Production Area. Counters choose a route to walk, and one data-keeper tracks all of the individuals and species found throughout the walk. Each group had butterfly nets, binoculars (if you turn the binoculars around it works as a great magnifying glass! ), identification guides, and tally sheets. Ready, set, go, and each group walks at a comfortable pace through the prairie, calling out "Clouded Sulphur!" or "What's that one coming at you, Graham?" Within 10 minutes, you get very good at picking out the common ones, even from a few yards away. However, once in a while a counter will net a butterfly and all of the volunteers will gather round to debate whether it's a Northern or Pearl Crescent ("that patch of orange is very open, but is it open enough to be a Pearl?"). It's a wonderful way to spend a few hours with like-minded nature-lovers. 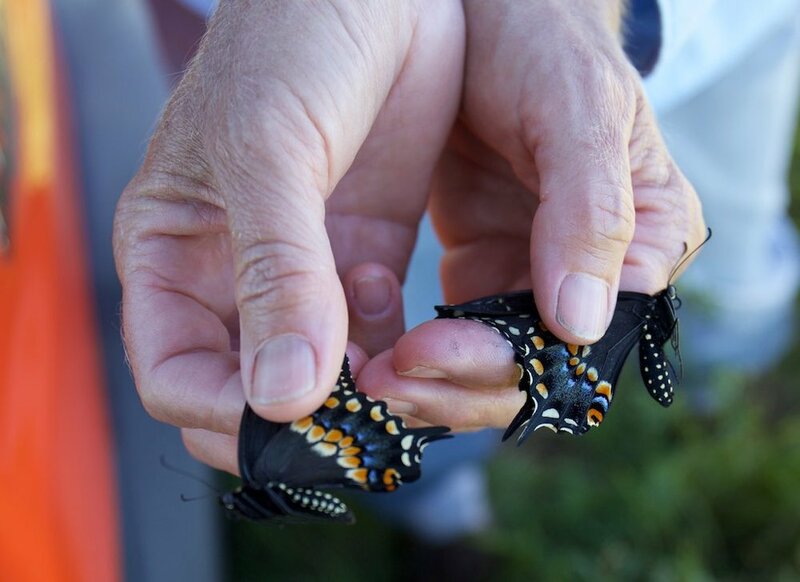 Our count's highlights were counting a record 970 butterflies and a record of 476 monarchs. In the past we averaged 545 individuals. We were disappointed to record a low of 14 species compared to an average of 17 species. In the past four years we found 24 species of butterflies on the counts. However, this year we found the only orange sulphur and five northern crescents for the Mud Lake Count, which as a whole ended up with 38 species. Both counts found high numbers of clouded sulphurs and ended with a count total of 598. Check the two tabs in the attached spreadsheet for count data. The first three years we conducted the count on July 1 or 2 and counted 23 to 68 monarchs. Last year we conducted the count on July 28 and found 344 monarchs. We always find more monarchs in late July compared to early July. The other two parties found 77 monarchs, and their past high monarch count in the past 29 years was 40 in 1991. It was 3:30 p.m. when we finished the count on the Manthe Prairie after finding 28 monarchs on 30 acres of restored prairie. Manthe Prairie contains a low number of common milkweeds, and in hopes of finding more monarchs by the end of the day, we decided to do one survey on nearby Erstad Prairie. Erstad Prairie has a 16 acre brome grass field with about 21,000 common milkweed stems per acre (yep, that's right: over 300,000 milkweed stems), adjacent to a seven acre restoration that was burned in spring and was full of blooming flowers! Mark Martin and Mark McGinley spent 45 minutes at Erstad Prairie and at first were not impressed since few monarchs were seen in the air. However, it did not take long to learn that the monarchs were resting in the vegetation. They found an impressive 10 mating pairs and ended with 201 monarchs! What a difference to have a high density of milkweeds. Each fall, Madison Audubon hosts monarch tagging events at Goose Pond to improve scientists' understanding of monarch migration and population trends. Monarchs are caught in nets, and teeny-tiny stickers are placed on one wing (in the perfect spot so as to not throw off their balance and flying capabilities). Monarchs with tags continue on their migration south, and are recorded in Mexico where the vast majority overwinter. It's fun, family-friendly, and unforgettable. Accessible, mown trails pass through some of the best nectaring habitat on the sanctuary, so people of all ages and abilities are welcome. The monarchs we found during the count will mate and lay eggs; those eggs will hatch, and the caterpillars will metamorph into adults that will lay more eggs. The adults that come from that generation are the ones we hope to tag this September. We have our fingers crossed that we will have a large monarch population in migration. If you would like to come out and net and tag monarchs in September you can sign up through the Madison Audubon website (keep an eye on madisonaudubon.org/events for registration to open in August). If you would be interested in helping count butterflies next July contact us at goosep@madisonaudubon.org.